Have you been waking up to a breakfast of chikoos and chai? Munching on an apple as a midnight snack? According to experts, you’re eating the right fruit but your timing is wrong. There’s a popular belief that healthy food can be eaten whenever you want. Experts say this is not true. To get the maximum benefits, they say, fruit should be eaten between meals, not along with lunch or dinner. That is because fruits slow down digestion, says Luke Coutinho, doctor of alternative medicine and founder of the health start-up Pure Nutrition. “If you want to eat healthy, what matters is how much of what you eat is absorbed by your body. Tea and coffee have substances like tannin and caffeine that hinder absorption of the nutrients you find in fruits like banana and chikoos. In fact, fruits are best absorbed on an empty stomach, early morning, as a snack between two meals, or before or after a workout to refuel your body," says Coutinho. Fruits are essential to a healthy diet—they’re a rich source of vitamins, minerals, natural sugars, enzymes, fibre and antioxidants. “Vitamins and minerals are necessary for life processes, antioxidants help flush toxins from the body and build up your immune system, while fibre is important for easy bowel movement," says Anita Jatana, chief dietitian, Indraprastha Apollo Hospitals, New Delhi. In addition, these nutritional powerhouses protect you from heart disease, stroke, certain cancers, gastrointestinal issues, high blood pressure, eye disease and chronic diseases, says Pavithra N. Raj, dietitian executive, Columbia Asia Referral Hospital, Bengaluru. The best time of day to have fruits, if you want to lose weight and make sure your body absorbs the maximum minerals and vitamins, is 30 minutes before a meal, says Shikha Sharma, a Delhi-based wellness consultant and nutritionist. The digestive enzymes released in the stomach help you digest the meal that follows. “Avoid eating citrus fruits immediately after a meal as dessert, as it will increase acid formation in the stomach, causing a feeling of heaviness and digestive problems, and minimize nutrient absorption," she adds. 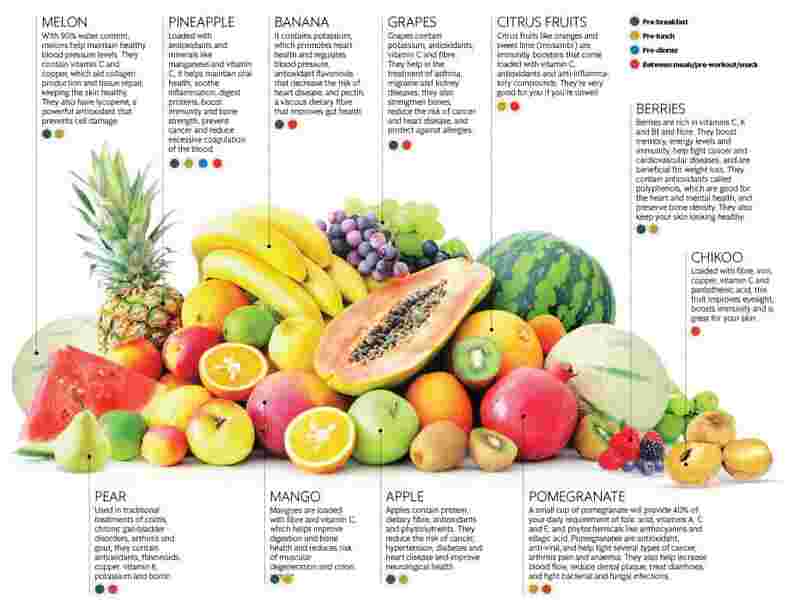 To imbibe the maximum benefits, fruits should be eaten fresh and whole, with fibre, skin and flesh intact, says Jatana. “Drying or extracting juice results in loss of vitamins and fibre, respectively, and the sugar concentration is also quite high," she explains. Stick to seasonal produce, and have a good variety. 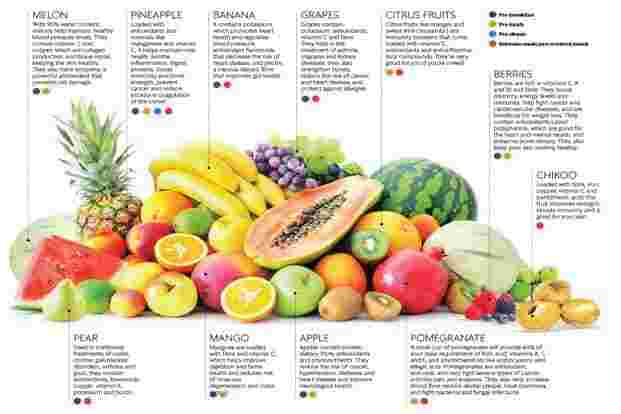 “Different fruits are rich in different nutrients, so it is best to have two-three different fruits daily and keep changing the type of fruit you consume to maximize benefits," Jatana says. Three servings a day is ideal—it could be a banana, apple or pear along with a small cup of melon or grapes. While fruits are healthy, people with lifestyle diseases such as kidney problems or diabetes need to choose their produce carefully. “If you suffer from kidney disease, include low-potassium fruits like apple, papaya, pears, guava, etc. in your diet," says Ritika Samaddar, chief dietitian, Max Healthcare, Delhi. People with diabetes should stick to fruits low on the glycaemic index (which measures the effect of carbohydrates present in food on blood sugar levels) like apples, berries, kiwi, peaches, apricots and oranges as a midday or mid-evening snack, keeping a 1-2-hour gap between meals to ensure sugar levels remain stable. So make sure you time it right when you reach for that banana or bowl of melon.